I have officially become a cord cutter. Yeserday saw the termination of all Sky TV services beyond what Freesat offers. So, in a year I have gone from two Sky Sports subscriptions to none. I do not know if this is significant, but anecdotally I have spoken to a number of friends who have taken the same course of action. When the likes of Amazon Prime and Netflix cost under a tenner a month, justifying forty quid for a few football or rugby games just doesn't cut it. Especially when they can be watched down the local pub. For me, it was the rugby. The only rights found on Sky now are some Pro12, some European Championship and French Super 14 games. I can find alternatives for all of them on BBC, S4C or BT Sport. So, paying a massive tax which goes almost directly into the pockets of Premiership footballers and the Murdoch family becomes really galling. Along with cutting out other packages, the result was a drop in our Sky bill from £102 to £33. We got most of the packages back by paying £7 a month for Now TV to add to our Netflix and Amazon Prime subscriptions. We also have a couple of Roku dongles and a Smart TV so everything is available on demand on these and our iPads. Selecting a dongle (or stick) wasn't easy. In the US Roku carries all three on demand services mentioned above. 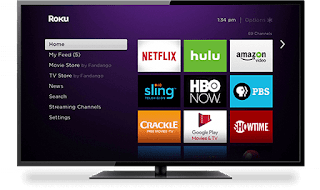 Unfortunately, in the UK Amazon Prime is missing, allegedly due to the investment made by Sky in Roku (whose box is used as a basis for their Now TV box). As far as I can tell, at the time of writing, the only way to get all the main on demand channels (BBC, ITV, 4, 5) plus the three on demand channels is to buy a Samsung Smart TV. I made the mistake a year ago if buying an LG set, which for some infathomable reason still doesn't have All 4 and ITV Player apps, and before you buy a Chromecast dongle, this suffers from the same shortcoming with a serious lack of services, as does its Amazon Fire TV rival.